Immediately after the Civil War there were many in the South who were unwilling to accept the rule of the victorious Union. Sensing an opportunity to import skilled farmers, the Emperor Dom Pedro of Brazil sent recruiters into the cotton belt states in search of experienced farmers. The Emperor offered an incentive of land grants and tax breaks in exchange for immigration. Robert E. Lee begged them to stay, but about 10,000 accepted the offer and settled in an area near Sao Paolo where they formed a colony that they named Americana. At first the Confederados kept to themselves much as other similar communities in other countries have, but after a generation or two began inter-marrying with the locals. Many others returned to the re-United States. However, enough remained to found a permanent community that remains today. Ironically, although slavery remained legal in Brazil until 1888, the Confederados for the most part found under-paying native labor to be cheaper than keeping slaves. As time passed succeeding generations began speaking Portuguese and raising sugarcane rather than cotton. 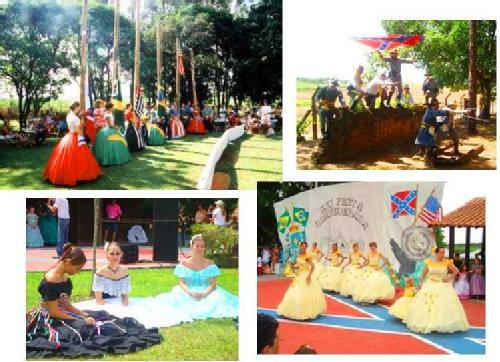 Today Americano is a city of about 120,000 about a tenth of whom are Confederado descendants. Each year they have a fiesta in which they celebrate the old South of their origins. A few years ago they finally removed the stars and bars from the city crest.